These three things go to the making of a Proverb: Shortness, Sense, and Salt. This is a collection of proverbs in two volumes entitled The Salt Cellars. About these a friendly reviewer said: "We are more interested in Mr. Spurgeon's applications than in many of the proverbs. 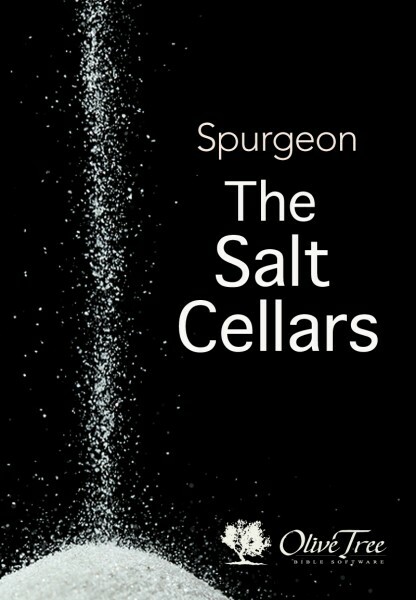 The reader asks himself as he lights on some familiar or unfamiliar proverb, 'Come, now, I wonder what Mr. Spurgeon will make of that.' For one never knows what he will make of it. The old-fashioned application of Aesop's Fables every child could anticipate, but there is no such commonplace and prosaic certainty about Mr. Spurgeon's applications, and therefore they have to be read." And in response to another criticism he wrote to George Augustus Sala: "I like the parts in which you pitch into me quite as well as those in which you praise." These volumes contain many of the proverbs published year by year in John Ploughman's Almanack, with shrewd comments thereon.